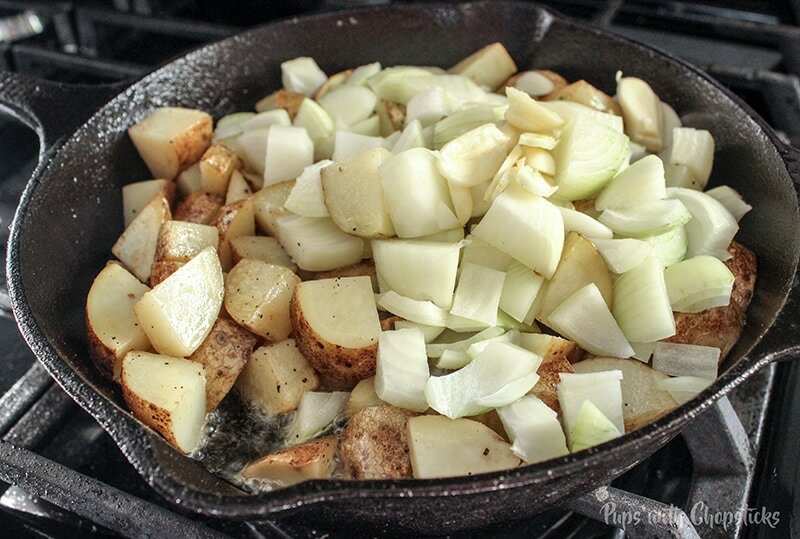 This simple skillet potatoes recipe is adapted from a recipe I learned to make from a friends mother. 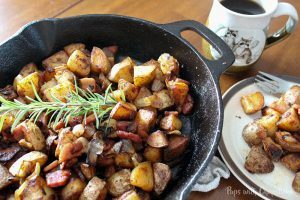 She called them Hangover potatoes, because this was the most requested recipe people would ask for after a night of wild drinking! Do they cure hangovers? They sure do! But who cares! 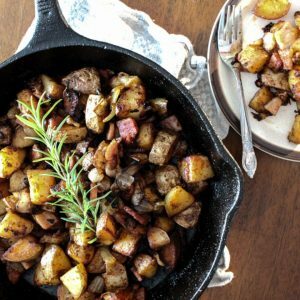 These skillet potatoes are greasy, AMAZINGLY flavorful (the ingredients and flavours just meld together), comforting and very simple to make — it literally can have less than less than 3-4 ingredients. 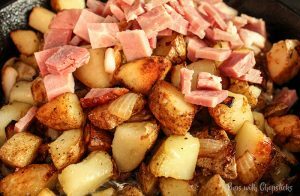 Hangover or not, I will gladly eat these any day – and since this is one my of the most requested dishes for shindigs (even from the pickiest eaters! ), I’d say this dish is very well loved as well regardless of how you want to serve them. These are essentially Turkish potatoes! Traditionally at the very end of the cooking process, she would put in diced tomatoes to give the dish a more soft and tomatoey flavour. I tweaked the recipe a bit and omitted the tomato to because I wanted a crispier texture as my end result — the tomato gives it a more soft and saucy texture. But please add the tomato and experiment with the flavour! It gives it a whole new different flavour 🙂 It’s the way it should be made! Optional: To give this dish an extra something something, I sometimes top it with a sunny side up egg, which transforms this to a hearty breakfast! 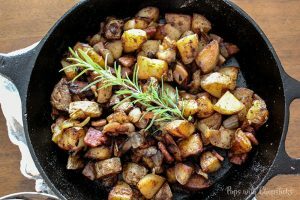 Mama Tip #1: She cooks the onions with the potatoes, be sure to put the onions a few mins after the potatoes to give it a head start in the cooking process so it doesn’t burn the onions. The onion infuses the oil with an amazing flavour which melds into the potatoes. Add the salt into the oil. 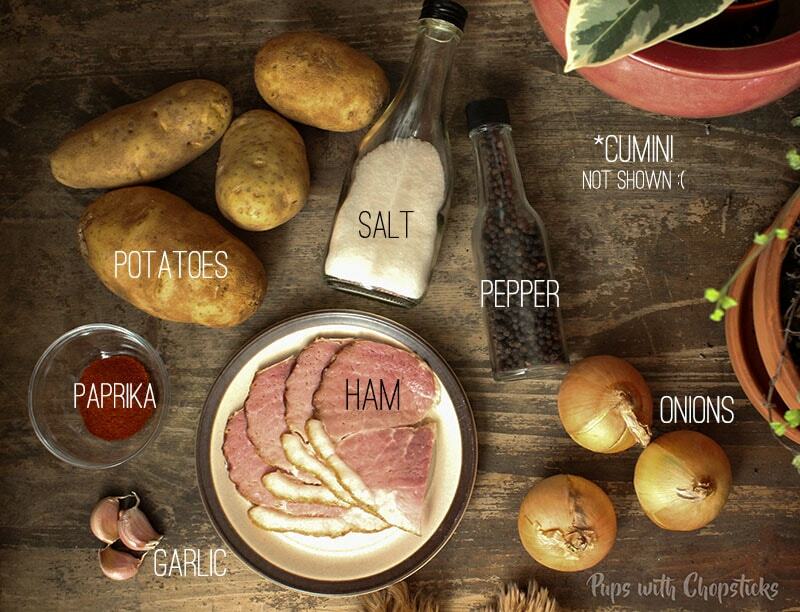 It allows the salt to evenly coat the potatoes during the cooking process. Don’t be shy in adding in more salt than normal, it brings out the flavours and you lose a lot of it in the oil during the cooking process. 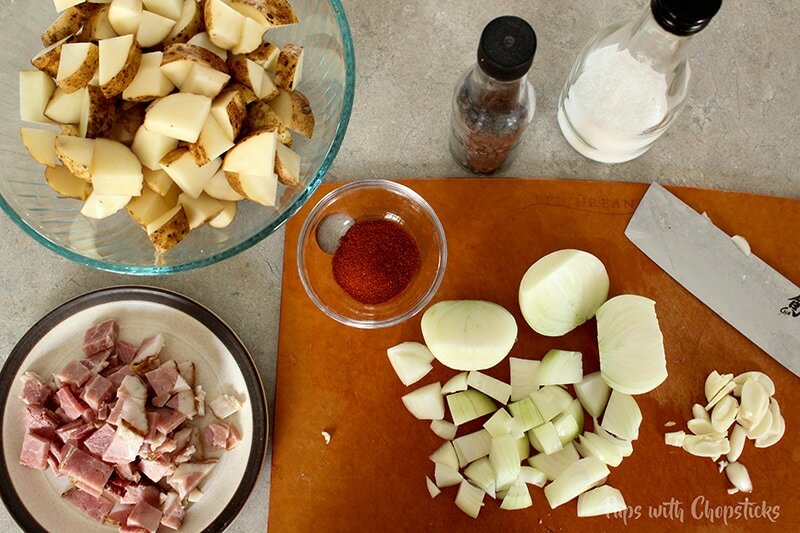 To crisp the potatoes, don’t touch them too much during the initial cooking stage. When we touch them too much we agitate the starch which doesn’t allow for that crispiness to happen. How much is 2 cms of oil? Never heard of cm in cooking. cm is centimeters. Which is approximately 1 inch. I have adjusted the recipe card to use inches instead of cm to avoid any confusion in the future. Thanks! These were very good with chipotle pork chops. The onions are not caramelized since takes about 40-45 minutes of cooking slowly for an onion’s sugars to caramelize, but they are delicious this way as well. I thought I was already a pro at making potatoes. I use my own special mix of spices, including these that you use, and add tons more garlic, some mexican cheese, and tons of green onions at the end. Usually I top with eggs as well! Anyway, after reading your method of cooking these potatoes, it really took mine to a whole new level! Best potatoes ever! Thanks so much for this amazing recipe. Your potatoes sound absolutely spectacular! I absolutely must try your additions as well this weekend for breakfast! Yes, yes you can do whatever you please because the chef always is boss. haha! This sounds amazing with an egg! A runny one! These look awesome- so simple and delicious!! 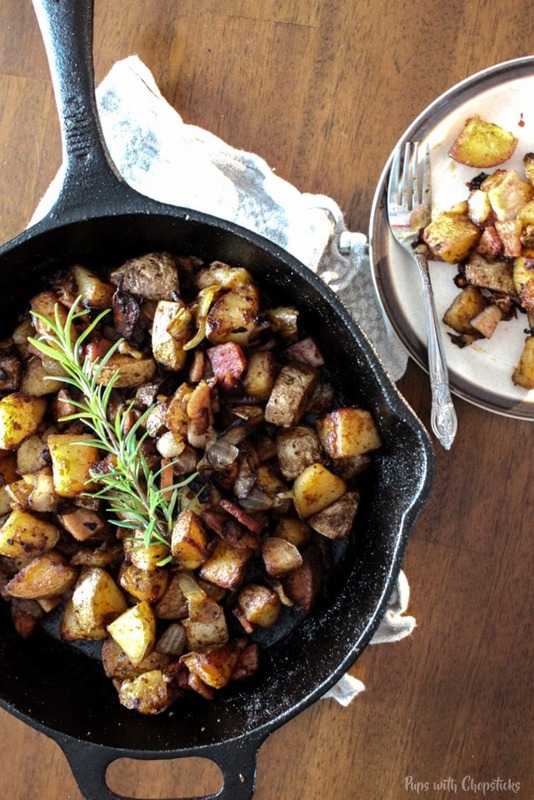 I’m a huge garlic lover, but I can also see how these potatoes would work without it! Odd eh? I am a huge garlic fan too! My guess is the onions and potatoes steal the show. This is total comfort food! Love it! Need to try! Oh this looks so good. The perfect mid-week dinner too, this must be made. Oh most definitely. When I feel like a meatless day, I just make this minus the meat! 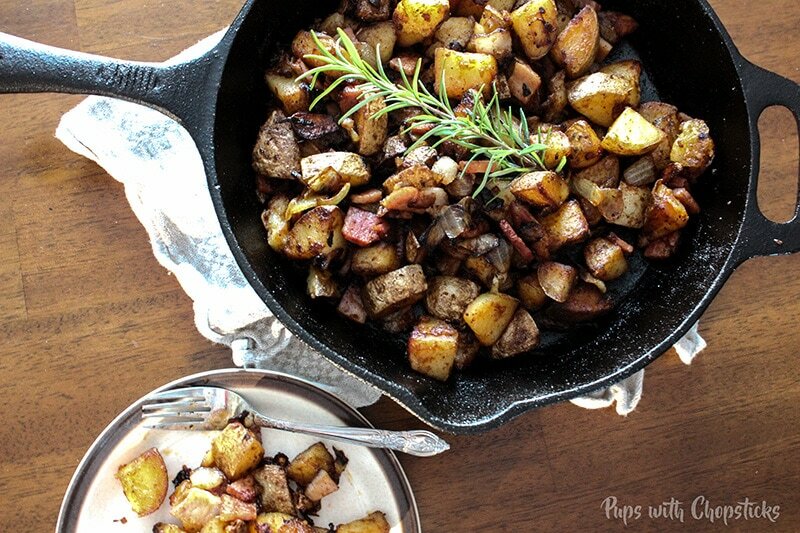 I love skillet potatoes! This one looks so good. My husband always ask for it for brunch! This looks so yummy! I was thinking that a runny egg on top would be perfect with this dish and then you mention it! Great minds think alike!